Once upon a time, I fell in love with a beautiful Cavalier King Charles Spaniel puppy named Barkley. His wonderful breeder Keith also bred English Toy Spaniels or ETS, a close cousin to Cavaliers. I got to visit Barkley a few times before he was able to come home, and each time, this really silly young ETS would romp and play and tackle the other dogs. She was a typical "teenager" dog, all legs and brattiness and nonstop energy. I laughed at her antics and Keith said "oh, that's Sweet Pea, she's really silly." Me and Barkley baby falling in love on the day we met. Sweet Pea is the little white and black pup near my knee. Her mom is on the sofa in back of me. A few weeks after Barkley came home with me, I decided to get him a friend. Not wanting to raise two puppies at once, I reached out to his breeder to see if he had any young adult Cavaliers available. He said he had two beautiful girls, and to come over to meet them. The grownup Cavalier ladies were unimpressed with Barkley's puppy antics despite his relentless efforts to engage them in silliness. During this visit, the little ETS Sweet Pea kept begging me for attention. She was so funny, with eyes bigger than her entire body and a comical expression, and she just wouldn't stop visiting with me and jumping into my lap. "Why don't you just take her?" Keith asked. "But I want another Cavalier," I replied. "Just take her home for a week, it will do her a world of good, you can bring her back next week and we'll try again with the Cavaliers." Of course, she never went back to him! I fell in love with her infinite goofiness, and because Barkley had lived with her from birth until I brought him home, he adored her, no matter how many times she would ambush him for a good wrestling match. She was such a little pirate that I listed her as BlueTide Anne Bonny on her AKC registration. "Sweeps", as her friends called her, never stopped entertaining people with her naughtiness. She only ever weighed between seven and eight pounds. She was small but mighty. As an adventurous woman who loves the outdoors, I wanted to camp and kayak but I didn't want to leave my dogs behind. I soon learned that Sweeps was fearless and ready to try anything. She loved to go kayaking in her little life jacket, and would sometimes try to "fall in" on purpose. A total brat whatever the occasion, she kicked Barkley out of their new Coleman bed on our first camping trip. You could dress her up, but you couldn't take her out. She always found the nearest mud puddle. Barkley absolutely adored his little "big sister" and she really took advantage of him. They got to enjoy an afternoon at a dog park for Barkley's first birthday and her gift to him was to try to bury him! Barkley just accepted anything she dished out to him. I adored her almost perfectly flat profile. There was only one thing that terrified my wild child. She was SCARED OF SANTA!!! Both dogs were absolutely terrified of Jolly Ol' Nick. Sweeps was quite the traveler. She got to live in the U.S. Virgin Islands and Hawai'i, where her kayaking adventures continued. After two years of island life, I decided to move back to Florida. I shipped my car from Hawai'i to California with the intention of taking a road trip across the USA. It's a long flight from Kona to Oakland when you're in a Sherpa! That journey turned out to be a huge hassle, because I could never leave the dogs in the car to go into a restaurant or grocery store, and I ended up eating way too many drive-through meals. Every night I'd have to move everything plus dogs from car to a motel room then back again into the car the next morning. The trip made me decide that I would buy a motorhome for the dogs. 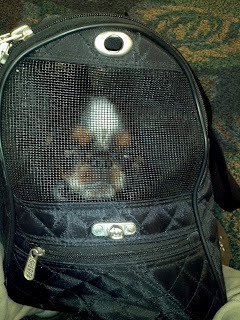 I could turn on the generator and air or heat and leave them in the motorhome while I got food or other supplies in non-dog-friendly establishments, and I wouldn't have to pack and unpack every day. Sadly, Princess Sweet Pea passed away not long after returning to Florida. Barkley was absolutely devastated by the loss of his sissy, so friends helped me rescue a buddy for him. "Redford," sprung from a kill shelter in Los Angeles, is a cutie patootie who is most likely a Cavalier/Dachshund mix. I'd retired early and a motorhome wasn't really in the budget, but the dream stayed alive. When a large corporation offered me a good paying customer service position, I accepted it. My plan was to buy the RV, pay it off, then quit. 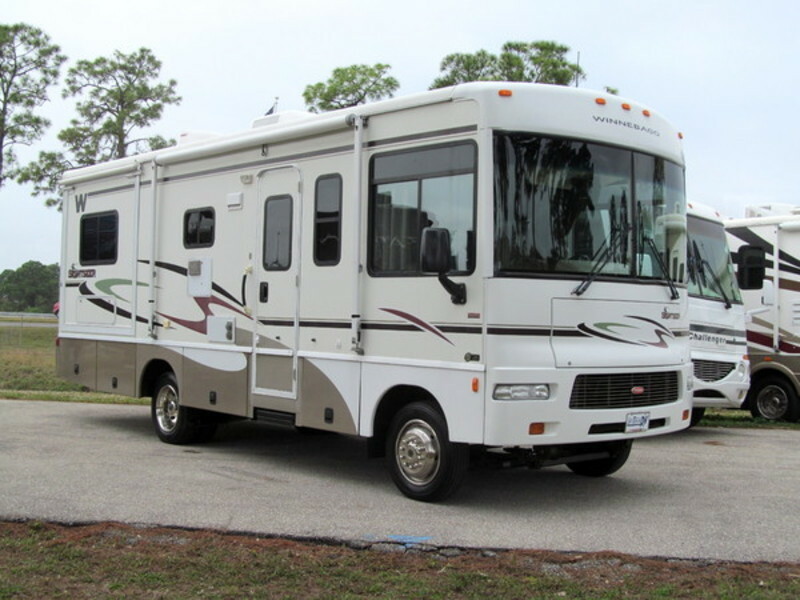 I spent many hours each week pouring over used RV ads looking for just the right Class B+, which I thought would be perfect for us. I found many that I liked but none was "the one". One evening while doing my usual B+ search, a small Class A popped up in the results. I'd never thought of getting one because they are usually so large, but this one was only 27' long. It was the perfect size, and I never knew it existed! Of course, once I saw the photo I knew it was the right motorhome for me and the boys...it looks just like Sweet Pea! Do you think the Winnebago's designer had Sweeps in mind? You can guess what happened next! I placed a hold on the motorhome over the phone and purchased it the following weekend. 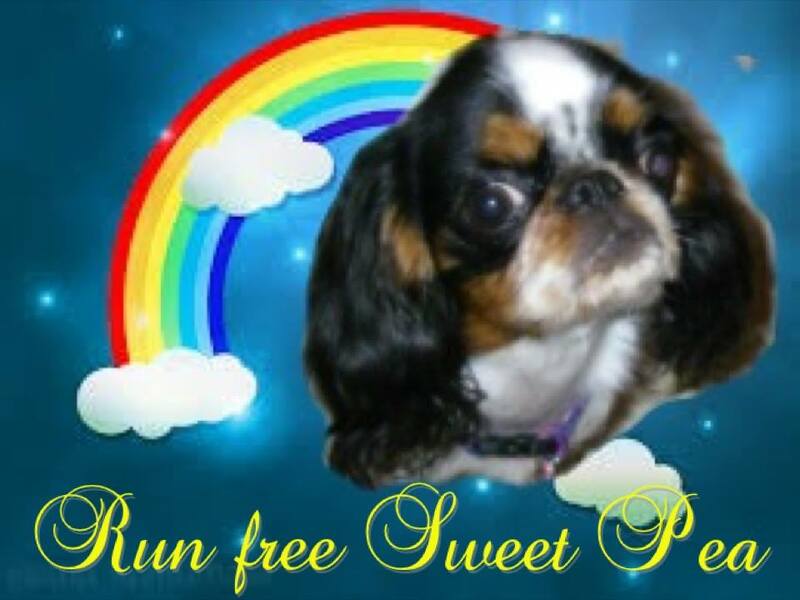 Of course it is named in Sweet Pea's memory. A photo of her in her life jacket hangs prominently next to the door, and there are other mementoes throughout the motorhome. My wee Pirate Princess would have loved the RV life. It's great for dogs. No matter where you park, their beds, their bowls, their treats, their leashes, everything is in the same place. From Key Largo to Yellowstone, they are always "home". Thanks for reading about my precious little doggy in Heaven, and about the naming of my home on wheels. Consider subscribing to get e-mail updates of new posts from the box on the upper right of this blog, and "like" my Facebook page. Feel free to comment, and to share with friends. 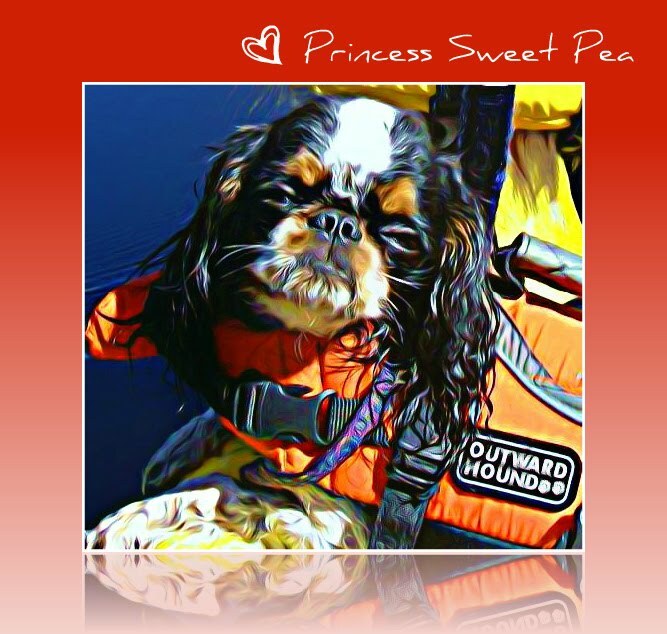 I leave you with some final images, digital creations by friends of the most adventurous and well-loved toy spaniel. I never knew how Sweet Pea came to live you and Barkley. Really enjoyed reading this. Thank you very much! Now I miss Barkley and Redford. 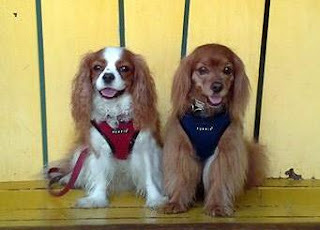 We took Barkley and Redford's new Cavalier King Charles short haired miniature cousin, Hollie to the vet to get spayed. They all remembered you and the boys and asked how you were doing and said to say hi. I told them about the MRI etcetera and the doctor rattled off it may be blah blah blah because of the eye removal. Now I wish I would have written down what he said. Anyway, I wanted to let you know how nice they were and that they remembered you. Thanks for the great story. Nice to know the rest of the story! Subscribe to get notification of the next entertaining post! Get notifications of our next entertaining post!